When it's time for your child to visit the dentist (we recommend around their first birthday), you may want them to see your family dentist. But you might also want to consider another option: a pediatric dentist. The difference between the two is much the same as between a pediatrician and a family practitioner. Both can treat juvenile patients — but a family provider sees patients of all ages while a pediatrician or pediatric dentist specializes in patients who haven't reached adulthood. Recognized as a specialty by the American Dental Association, pediatric dentists undergo about three more years of additional post-dental school training and must be licensed in the state where they practice. They're uniquely focused on dental care during the childhood stages of jaw and facial structure development. 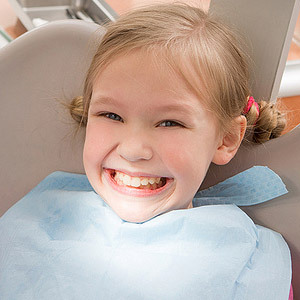 Pediatric dentists also gear their practices toward children in an effort to reduce anxiety. The reception area and treatment rooms are usually decorated in bright, primary colors, with toys and child-sized furniture to make their young patients feel more at ease. Dentists and staff also have training and experience interacting with children and their parents to help them relax during exams and procedures. While a pediatric practice is a good choice for any child, it can be especially beneficial for children with special needs. The “child-friendly” environment is especially soothing for children with autism, ADHD or other behavioral/developmental disorders. And pediatric dentists are especially adept in treating children at higher risk for tooth decay, especially an aggressive form called early childhood caries (ECC). Your family dentist, of course, can presumably provide the same quality care and have an equally welcome environment for children. And unlike a pediatric dentist who will typically stop seeing patients when they reach adulthood, care from your family dentist can continue as your child gets older. In the end it's a personal choice, depending on the needs of your family. Just be sure your child does see a dental provider regularly during their developing years: doing so will help ensure a lifetime of healthy teeth and gums. A child with a chronic illness or condition often requires a lot of focus on care for their special needs. Other aspects of their health can often take a back seat — too often including dental care. 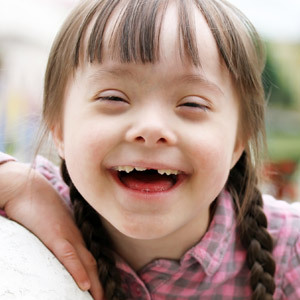 Proper dental care can be a challenge for special needs children if they have diminished physical, intellectual or behavioral capacities. Children with autism or attention deficit disorders may not be able or willing to perform tasks like brushing and flossing. Other conditions could make them intolerant to toothpaste in the mouth, or create an inability to keep their mouths open or to spit. Some chronic conditions also seem predisposed to dental defects. For example, enamel hypoplasia, a lack of sufficient tooth enamel, is common with Down, Treacher-Collins or Turner Syndromes, and can greatly increase the risk of tooth decay. But even though difficult, effective dental care isn't impossible. It begins with your dental provider. Pediatric dentists are often excellent in this regard: they often have the training and experience to treat children with chronic conditions. Whoever you choose must be able to partner with you in caring for your child's dental needs. Daily hygiene is also a critical factor. Your goal should be the same as with any child — to teach them to brush and floss for themselves. Depending on their condition, however, you may need to assist them for a longer term, perhaps permanently. But it is imperative — daily hygiene is their best defense against oral diseases. You should also consider their medication and how it may impact their dental health. Antidepressants, antihistamines or drugs that assist with breathing function can cause mouth dryness. This, as well as drugs with sugar or acid compounds, can increase risk for dental disease. If they must take these types of medications, try to give them at mealtime to reduce their effect in the mouth. Above all, pursue the same professional dental care as you would for any other child. Keep up regular dental visits beginning around their first birthday for cleanings and preventive measures like topical fluoride or sealants. By taking these measures you'll help ensure their dental health won't suffer. Dentures can be an effective and affordable solution for people who've lost all their teeth. With them a person can once again eat nutritiously, speak clearly and smile confidently — and with regular care they can last for years. 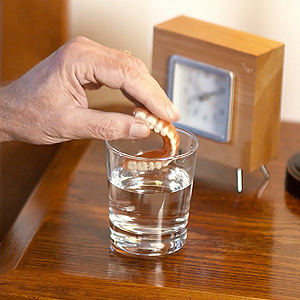 As part of that ongoing care, be sure you consider one important thing with your dentures: you may want to take them out at night while you sleep. If you do you'll lessen your chances of developing these 4 health problems. Accelerated bone loss. Traditional dentures are fitted to rest securely on the gums. 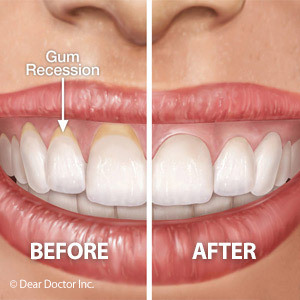 This, however, creates pressure on the gums and the bony ridges beneath them that can contribute to bone loss. Wearing dentures around the clock usually accelerates this process, which could eventually lead to among other problems looser denture fit and discomfort. Bacterial and fungal growth. Microorganisms that cause oral diseases find conducive breeding spots on the underside of dentures while they're worn in the mouth. Studies have found that people who continuously wear their dentures are more likely to have bacterial plaque and oral yeast than those that don't. Potentially dangerous infections. Bacterial and fungal growth increases your risk of oral infections that could affect more than your mouth. A recent study of elderly nursing home residents found those who wore their dentures during sleep were over twice as likely to develop serious cases of pneumonia requiring hospitalization. It's believed bacteria harbored on the dentures can pass from the mouth to the lungs as a person breathes over them while they sleep. Blocked salivary flow. During the night our salivary flow naturally ebbs; wearing dentures while we sleep could cause denture stomatitis, in which the tissues covered by a denture (particularly along the roof of the mouth) become inflamed and infected with yeast. It's often accompanied by angular cheilitis or cracking at the corners of the mouth that becomes infected by the same yeast. Wearing your dentures while you sleep contributes to conditions ranging from irritating to life-threatening. To prevent such problems clean your dentures as well as the rest of your mouth regularly — and talk to your dentist whether you should leave them out when you go to bed.